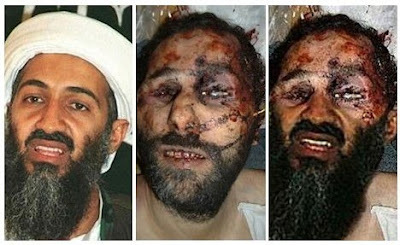 La foto del supuesto cadáver de Osama Bin Laden que ha circulado esta mañana por diferentes medios de comunicación españoles y del mundo es falsa. La imagen ya ha sido utilizada en ocasiones anteriores y se trata de un montaje hecho a partir de otra fotografía. En varias páginas web (como ésta) se puede comprobar que ya había sido utilizada con anterioridad. Además, en YouTube, la misma captura aparece en un vídeo -ahora retirado- de hace dos semanas. Entre otros medios, Público.es también publicó durante unos instantes la fotografía, enviada por la agencia Associated Press. 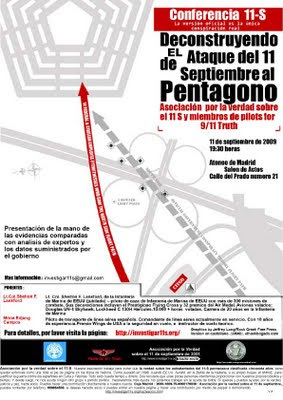 Whenever a large manifestacion is organized in Madrid (this one was called by the unions to defend their pensions) , the 911 truthers make their presence known. We put up our information panel and handed out information to all of the journalists coming in and out of "El Pais", spains leading paper. The object of our visit was to get them to cover the Niels Harrit event on Tuesday http://www.investigar11s.org/nielsharrit Lets hope it works. We spend many saturdays and sundays in the main park of Madrid giving out information . The director Francisco Trento will be at all the showings to discuss afterwards. 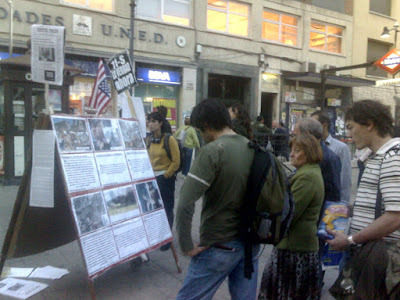 In Madrid we created an information post about 911 that you can easily fold up and carry from place to place, the crowds form around it immediately. Note: 11-M is what is used in Spanish for the madrid bombings. In Leganes the supposed terrorists alledgidly blew themselves up after the bombings when the police were at their door (one policeman died). Italic text are my notes. MADRID .- First they said that he and his brother Moutaz were the brains of 11-M. Later, he was sentenced to 12 years and, last July, the Supreme Court acquitted him. Today he speaks for the first time in the newspaper El Mundo and considers that he and his family have become "the other victims of the 11-M" and that the confidants know much more about the attacks. On July 17th he received the good news in the prison in Alicante that the Supreme Court was acquitting him of all charges and that he was a free man. This is an excerpt from the interview. "If it were true that those who were on that floor had killed 192 people, how could they become friendly terrorists and wait until the entire building was cleared to commit suicide?". 911 truth Madrid invades McCain act and get lots of press! 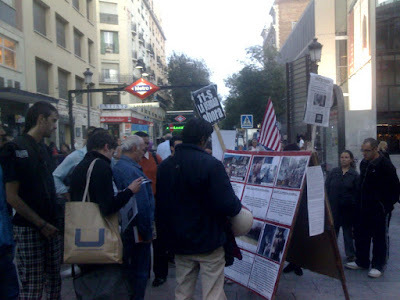 McCain (sounds like McDonalds doesnt it) had a rally here with about 20 people in Madrid, we (the 911truth group ) invaded and came out on tv, and press because our signs were so big they couldnt be avoided.